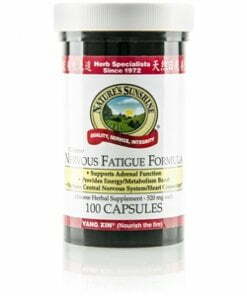 Nature’s Sunshine Nervous Fatigue Formula, Chinese draws on traditional Chinese medicine. Yang xin, the Chinese name for the formula which means “to nurture the heart,” is considered a fire-enhancing formula that nourishes the digestive system. Nervous Fatigue helps alleviate stress as well as encourages a good night’s sleep. It combines the following herbs: zizyphus, biota, and schizandra.